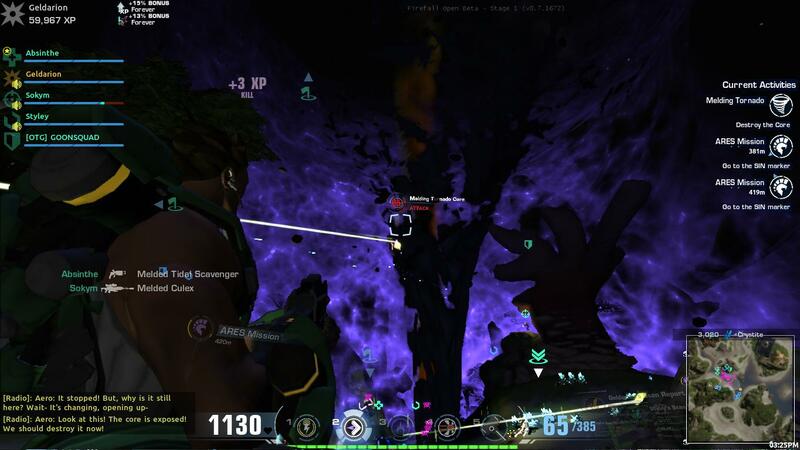 For those who don’t know, FireFall is a combination between a First Person Shooter and an MMO. It is a sandbox-style game that has crafting as the main form of upgrading weapons and your armor. I played for a couple of hours last night, and I wanted to talk about what I saw. 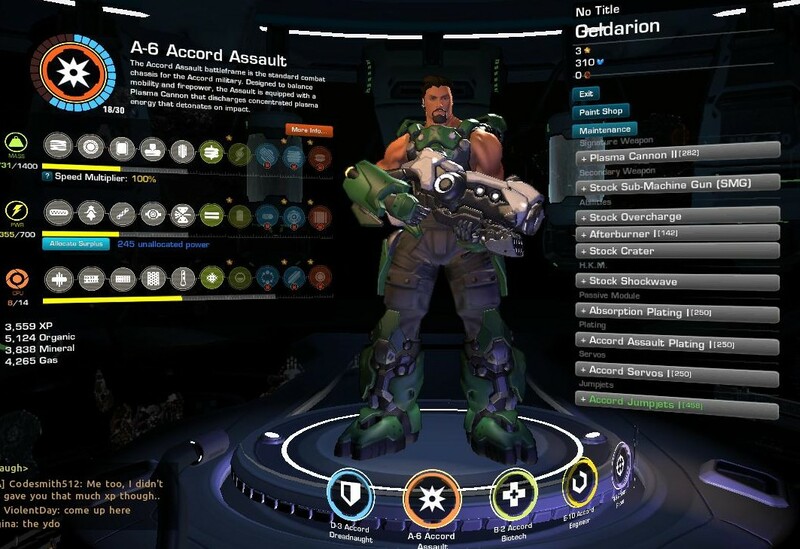 Here’s twenty-five things you need to know about FireFall. 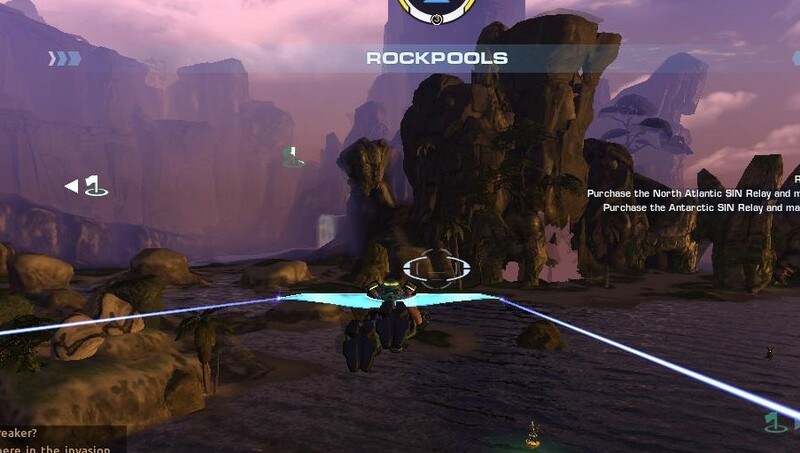 FireFall is currently in open beta, is free-to-play, and seems to keep experience points through server wipes. Making progress in the beta will probably give you a head start at launch, even if your character is deleted. The game feels like a combo of Halo, The Secret World, and Mass Effect. Your “class” is defined by what suit of armor (called “battleframes”) you are wearing, though all classes get a jetpack (kinda unrelated, but awesome!). You upgrade your frame in a number of ways, through uses of items, experience points, currency, and resources. Upgrading your frame also unlocks fancier versions of the five basic frames. You don’t have to stick to one class. It is much like The Secret World in a way, because at any time, you can switch frames to try something new, but you will start from scratch on the new one, though the old frame’s progress is saved. Theoretically, it is possible to work on all of the frames and be able to switch to any role at any time, though there are frame-specific items and upgrades. You are given three power slots, plus a special HKM (Hyper-Kinesis Module) skill that does a lot of…something. Depends on what your frame is. 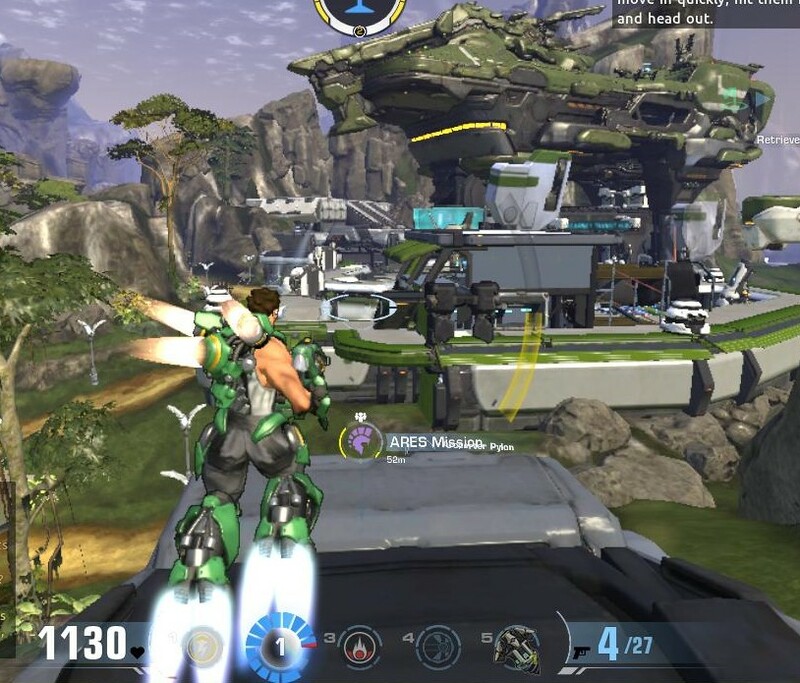 For example, the Assault frame does a huge shockwave, while the Engineer frame creates a usable gun platform. There are special weapons for each frame, but there are some weapons that are common and able to be used by every frame. Weapons run off a basic ammo/reload system. Monsters drop ammo, health, and currency, so you shouldn’t run out unless you are out of the fray (i.e. sniper). The game is really easy to get into. It’s very easy to learn what to do, it’s fun to shoot things, and you can feel useful right away. It also has many layers of customization past the initial glance, providing a lot of underlying complexity after you get used to the simplicity of it. There is a very complex and compelling crafting system. Your best upgrades come from crafting. Currently, most of your time in the world is spent gathering crafting materials (resources) in two phases, scanning and thumping. Scanning uses a hammer that gives you mineral deposit information about quality, percentage, and type. After you pick a spot to excavate, you use a “thumper,” which starts mining that area. Since the thumper…well…thumps, it attracts a lot of local wildlife. With a bigger group, you can use bigger thumpers, increasing the payload and increasing the challenge by bringing in more and bigger wildlife. Sprint is a good way to get around, though the best way (if you don’t take a shuttle from one place to another) is to use gliders. There are even portable glider stations you can put up on high mountains to really decrease running time. Careful though, one wrong move and you plummet to your death. Let’s just say I’m 4 for 12 on successful glider flights. 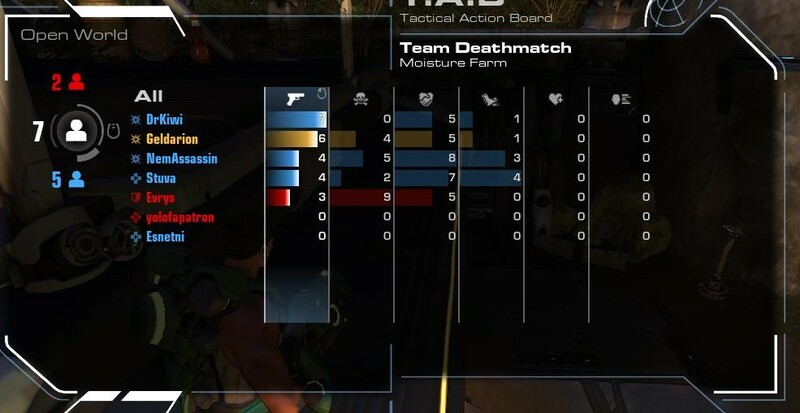 PvP is all standard frames that are not impacted by gear earned in the open world. It takes your skill and weapon setup from your current frame, then it boosts it to max level and power. There is only one faction, so no open world PvP at the moment, but they do plan on making a free-for-all server. Think Blood and Glory ruleset in Age of Conan. The story is actually really intriguing, and there are plans for episodic story content soon. The Chosen are the main bad guys and they are…something. Not really sure what. The game isn’t super clear about why they are attacking, but the episodic story content will probably help that. The first thing to do in the game is to get all of the areas unlocked by accessing towers that open up the Fog-of-War. Doing so also rewards you with a portable glider platform on an astonishing hour-long cooldown. This also gives you a boat-load of XP, probably 50,000 total, which keep in mind, a lot of the initial unlocks for a suit are around 3k-10k. Texas is its own country after the US falls to pieces. Y’all are still welcome to come hang out though. You can pick your voice at character creation. You can also change it if it is annoying. Painting your frame is easy, though cool colors are locked behind a pay-wall. There is only one zone at the moment, which can make the game feel small (even though it is a large zone), but there will be more zones soon. They are just focusing testing right now. ARES Missions are quick little random events that everyone can participate in. These, in conjunction with Thumping, are the main ways to earn XP right now. There is a substance called Melding, which is like a large energy field that is covering most of the Earth after a time-space continuum calamity. Don’t get in it or it kills you. It can be pushed back with a series of Repulsors to access certain areas that are normally Chosen territory. There is a random event where a Melding tornado spawns, and it is an insane sequence of events. I was completely confused when I did it, though that could have been because I had only been playing for about an hour. My group did finish it, though I died, so I got a pretty sweet purple weapon for a different frame that I might try. In short, you should try the game. It is free, it only takes 4 GB of hard drive space, and getting in and having fun is really easy. Let me know what you think or if you are in the game as well!